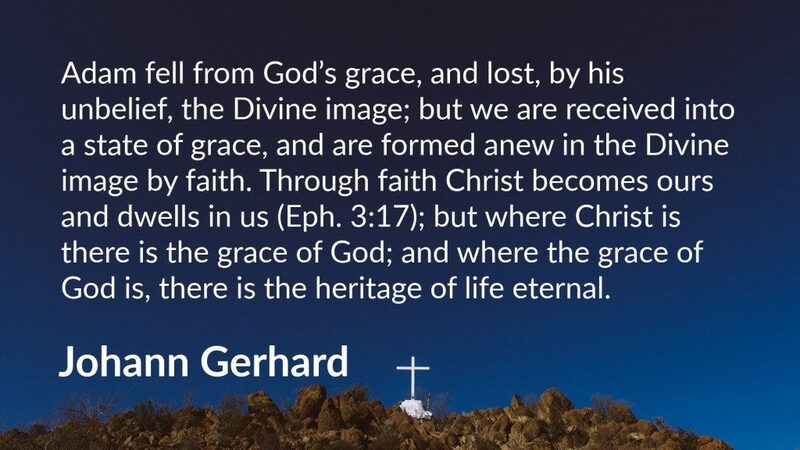 Adam fell from God’s grace, and lost, by his unbelief, the Divine image; but we are received into a state of grace, and are formed anew in the Divine image by faith. Through faith Christ becomes ours and dwells in us (Eph. 3:17); but where Christ is there is the grace of God; and where the grace of God is, there is the heritage of life eternal. Johann Gerhard, Gerhard’s Sacred Meditations, trans. C. W. Heisler (Philadelphia, PA: Lutheran Publication Society, 1896), 65.